Liverpool’s only and the UK’s first dry-bar is serving up a sense of community this Christmas. In a bid to create an all-inclusive environment, the Parr Street venue has devised a carefully crafted Christmas menu comprising home-made meat, fish and vegetarian dishes. 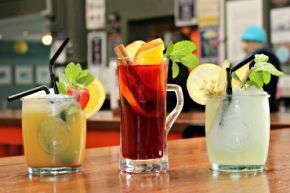 To accompany its culinary offering, the eatery will be serving up a variety of Festive Mocktails and Pitchers including Mulled Mixed Berry Punch, Brink Toddy and Spiced Cherry. General Manager of The Brink Carl Bell said: “Here at The Brink, our primary focus is on well-being and our aim is to create a safe space whereby guests from all walks of life can come together and celebrate the most wonderful time of the year. While Christmas is renowned as a time for unwinding and celebrating amongst family and friends, we recognise that there are still some individuals who may feel isolated. To start, guests can choose from Chicken Liver Pate served with Toast & Cumberland Sauce or Chef’s Homemade Soup with Rustic Bread. For a main course, diners can opt between Roast Turkey with All The Trimmings (Pigs in Blankets, Stuffing, Roast Potatoes, Yorkshire Puddings & Seasonal Vegetables), Poached Fillet of Salmon served with Creamed Leeks, Broccoli & New Potatoes and Mediterranean Vegetable Parcels served with Seasonal Vegetables & New Potatoes. Dessert offerings include Christmas Pudding with Custard or Chocolate Brownies with Ice Cream and Chocolate Sauce. The Brink’s festive menu is priced at two courses for £12 or three courses for £15, with all meals including complimentary tea, coffee and Homemade Mince Pie. All bookings come with Christmas Crackers.